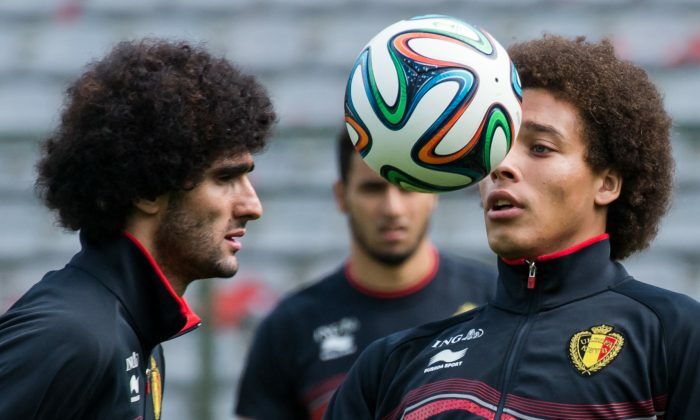 Marouane Fellaini has scored for Belgium. Check out the goal below. Check out an Associated Press article on today’s matches. RIO DE JANEIRO (AP) — Neymar and his Brazilian teammates will be back in action for their second match at the World Cup, before Russia and South Korea have even kicked off their campaigns. Brazil won the tournament’s opening game last week against Croatia and on Tuesday will meet Mexico, which beat Cameroon 1-0 in its first Group A game. A win for either team would go a long way toward securing a spot in the next stage. Russia vs. South Korea is the second of two Group H matches on day six, which gets underway with Belgium against Algeria. HIGH STAKES: Brazil striker Hulk is a doubtful starter after missing training for two days due to a left leg injury, meaning coach Luiz Felipe Scolari may have to change a winning formula. Five-time World Cup champion Brazil has won 16 of its last 17 matches, including the Confederations Cup on home soil last year, and Scolari attributes that to sticking with a formula. If Hulk is ruled out, Chelsea midfielder Ramires and 21-year-old Bernard could come into contention for a starting spot. The Brazilians got the benefit of a questionable penalty call in their 3-1 comeback win over Croatia, while Mexico had two contentious decisions go against them before Giovani Dos Santos found the back of the net against Cameroon. Coincidentally, Brazil and Mexico met at Fortaleza in the Confederations Cup last year, with Neymar scoring to help the home team to a 2-0 win. Neymar, who lived up to expectations last week with two goals in the win over Croatia, has had a change of hairstyles in between. The Mexicans have won seven of the last 15 matches against Brazil. And Mexico won the 2012 Olympic gold medal, beating Brazil in the final. Mexico “has always created difficulties for Brazil and I’m sure it won’t be any different this time,” said Oscar, who was on the Brazil team that lost the Olympic final. The winner of Tuesday’s match would be guaranteed a spot in the next round if Cameroon and Croatia draw their match on Wednesday in Manaus. Venue: Fortaleza. Kickoff: 4 p.m. local time (3 p.m. in New York, 8 p.m. in London, 4 a.m. in Tokyo). POTENTIAL HAZARD: If playmaker Eden Hazard lives up to his billing, Belgium should advance to the knockout stage from its group. Belgium coach Marc Wilmots thinks the 23-year-old Chelsea star is destined for great things, and is building a team around him. The team is led by central defender Vincent Kompany, who has helped Manchester City to two Premier League titles in three seasons. And if rival teams get through the defense, there’s 22-year-old goalkeeper Thibaut Courtois, who helped Atletico Madrid reach the Champions League final. He thinks there might be some deficiencies in the Belgian defense that the likes of central midfielder Sofiane Feghouli and striker Islam Slimani might be able to exploit. “Favorites don’t always win,” said Halilhodzic, who hasn’t put it past his Algerian squad to produce another major World Cup upset to follow the African country’s win over West Germany in 1982. Venue: Belo Horizonte. Kickoff: 1 p.m. local time (noon in New York, 5 p.m. in London, 1 a.m. in Tokyo). LOUD AND CLEAR: Russia’s captain and playmaker Roman Shirokov is missing the tournament, a major setback for a squad that already is building up for the 2018 World Cup that their country is hosting. His replacement as captain was only confirmed on the eve of Russia’s opener against South Korea, with Vasily Beruzutsky overcoming a foot injury and getting the nod from coach Fabio Capello on Monday. Denis Glushakov and Viktor Faizulin are contenders to replace Shirokov in midfield. Young striker Alexander Kokorin is likely to start up front. South Korea is one of Asia’s best hopes at the tournament, even after a stuttering qualifying campaign. Hong Myung-bo was captain when South Korea went on its famous run to the World Cup semifinals in 2002, and now he’s hoping to get the country at least through the group stage as coach. To do that, he needs the likes of Bayer Leverkusen forward Son Heung-min and Sunderland playmaker Ki Sung-yeung to prove themselves at the highest level. Venue: Cuiaba. Kickoff: 6 p.m. local time (6 p.m. in New York, 11 p.m. in London, 7 a.m. in Tokyo).